In the current age of GPS and satnav dependency, smartphone users rarely consult the compass feature native to nearly all the major ecosystems. 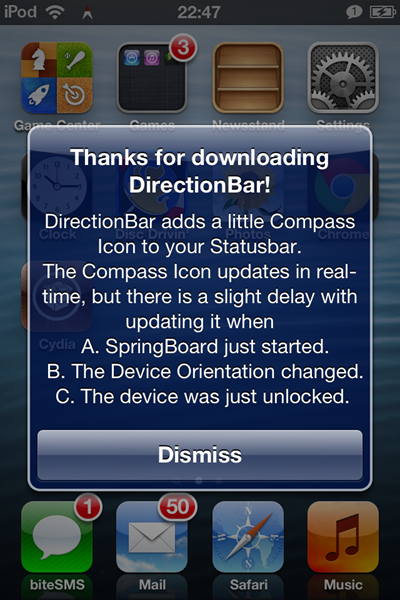 However, the ability to familiarize oneself with the functions and features of a compass is an integral part of orienteering, and a tweak by the name of DirectionBar brings the compass to your iOS device’s status bar. You may think, given the limited dimensions of the status bar, that the compass would be difficult, if not impossible to view. On the contrary, it actually appears very crisply and clearly, and although those with particularly bad eyes may naturally struggle, the compass brings a useful, live icon to what is otherwise a wasted space. Moreover, the compass can be readily themed to suit the tastes of the users, and although, with DirectionBar being new and all, there are only a handful of alternatives available at this point in time, we’ll likely see many more cropping up through Cydia in the not-so-distant future as users pit their creative wits. Those with a little nous in Photoshop or GIMP can easily create their own, and select them by dropping them into the relevant folder as described when the tweak is first installed. If you’re a bit of a traditionalist, and don’t mind offering a small amount of your status bar to a compass, I cannot recommend DirectionBar enough. Even if, regrettably, you’re considering it as a gimmick, it adds a touch of class and elegance to proceedings, as the screenshots demonstrate. If you would like to get started with DirectionBar, you can do so by heading over to the BigBoss repository in your source list in Cydia. It’s absolutely free of charge, and because it’s so minimal, will not impinge on your device’s resources. It works with iPhone, iPad and iPod touch, so provided you’re jailbroken, you’ve no excuses!